2020 Census Citizenship Question Plans Halted By Maryland Judge Plans to use the 2020 census to ask about U.S. citizenship status suffered another major blow. A ruling in Maryland joins earlier ones in New York and California blocking the citizenship question. 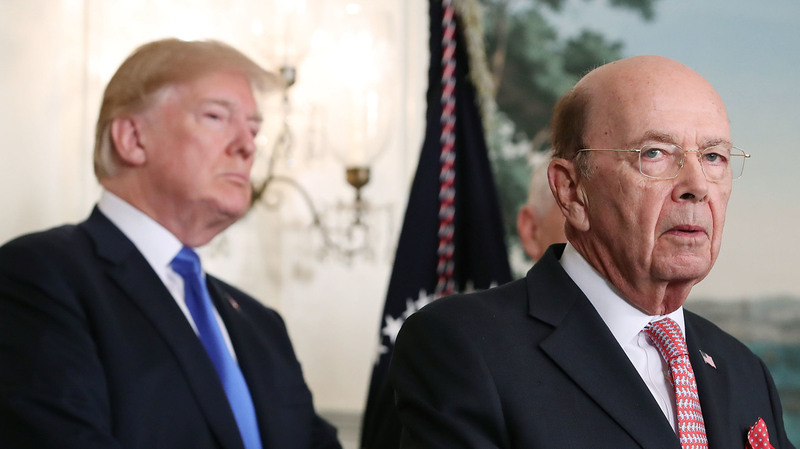 President Trump listens as Commerce Secretary Wilbur Ross, who oversees the census, speaks at the White House. Ross approved including in the 2020 census the question, "Is this person a citizen of the United States?" A third federal judge has found the decision to include it on forms for the national head count to be unlawful. "The unreasonableness of Defendants' addition of a citizenship question to the Census is underscored by the lack of any genuine need for the citizenship question, the woefully deficient process that led to it, the mysterious and potentially improper political considerations that motivated the decision and the clear pretext offered to the public," wrote U.S. District Judge George Hazel of Maryland in a 119-page opinion released on April 5. Hazel concluded that the decision by Commerce Secretary Wilbur Ross, who oversees the census, to add the question violated administrative law. Federal judges in New York and California previously came to the same conclusion. Similar to the earlier ruling in California, the judge also found that including the question would be unconstitutional because, at a time of increased immigration enforcement and anti-immigrant rhetoric, it hinders the government's ability to count every person living in the U.S. once a decade as the Constitution requires. Hazel ruled that the plaintiffs did not provide enough evidence to prove two additional claims — that adding the question was intended to discriminate against Latinos, Asian-Americans and immigrants; and that it was part of a conspiracy within the Trump administration to violate the constitutional rights of noncitizens and people of color. The attorneys who brought those claims in one of the two citizenship question lawsuits in Maryland are considering appealing that part of Hazel's ruling, according to Thomas Saenz, the president and general counsel of the Mexican American Legal Defense and Educational Fund. Attorneys with the civil rights organization, along with Asian Americans Advancing Justice, helped represent a group of plaintiffs led by the Texas-based community group La Unión Del Pueblo Entero. "I think it's now patently undeniable that the inclusion of the citizenship question was completely illegitimate," Saenz said. "The federal government should do the right thing and remove the citizenship question." The Trump administration has insisted that the Justice Department wants responses to the question to better enforce a part of the Voting Rights Act that protects racial and language minorities against discrimination. In his opinion, however, Hazel found that the administration "manufactured" that reasoning. He echoed the earlier ruling in California by U.S. District Judge Richard Seeborg, who wrote that the enforcement of the civil rights law is "nothing more than a pretext designed to provide cover for the Secretary's unexplained desire to add the citizenship question to the census." Shankar Duraiswamy, from the law firm Covington & Burling, is the lead attorney who represented a group of individuals from states including Maryland and Arizona in the other lawsuit. He noted in a written statement that Hazel's ruling "establishes that the question will actually undermine the voting rights of citizens who live in states and communities with significant Latino and immigrant populations." The Justice Department is disappointed by Hazel's ruling, according to a statement from Kelly Laco, a DOJ spokesperson. "Our government is legally entitled to include a citizenship question on the census and people in the United States have a legal obligation to answer," Laco wrote. The administration is appealing this latest district court ruling in the almost yearlong legal battle to the 4th U.S. Circuit Court of Appeals, according to a court filing released on Monday. The ruling is likely to be appealed all the way to the Supreme Court. A Supreme Court hearing about whether including the question is constitutional and about the New York ruling, which has already blocked the citizenship question, is scheduled to be held on April 23, and the justices are expected to rule by June on whether the 2020 census will ultimately include the question. President Trump recently weighed in on the controversy with a tweet calling a census without the "all important" citizenship question "meaningless and a waste" of the billions the head count costs. If the question is included, the Census Bureau is expecting fewer households to self-respond to the census, particularly among Latinos and households with noncitizens, including unauthorized immigrants. Critics of the question worry that would affect the accuracy of new population numbers that determine how many congressional seats and Electoral College votes each state gets. Census numbers also guide how an estimated $880 billion a year in federal tax dollars for Medicaid, schools and other public services is distributed to local communities around the country.